The goal of Multimedia Systems is to provide a broad understanding of multimedia systems and applications in an integrated manner. A user can enjoy a multimedia application only if all the pieces of the end-to-end solution fit together. This means that a multimedia application must be developed in integrated fashion, taking into account the underlying technology described here. 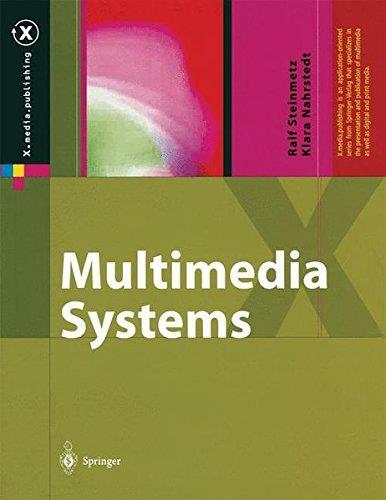 In this volume, we present fundamental characteristics and properties of multimedia operating and communication systems. Of special interest to readers will be those chapters dealing with scheduling algorithms and other OS-supporting approaches for multimedia applications, with their soft-real-time deadlines; multimedia file system internals and servers, with their decision algorithms for data placement and scheduling; multimedia communication, transport, and streaming protocols and services, with their error control, congestion control and other Quality of Service awareness and adaptive algorithms; synchronization services, with their skew control methods; and group communications, with their group coordinating algorithms and other distributed services. Ralf Steinmetz is Professor of Multimedia Communications at the Technische Universität Darmstadt, Germany, and he is chairman of the Board of the Telemedia Center httc.. Together with more than 20 researchers, he is working towards his vision of "truly seamless multimedia communications". He has co-authored over 200 refereed publications, serves as a member of the board of numerous professional committees, is an ICCC Governor, and is a Fellow of both the IEEE and the ACM. Klara Nahrstedt is the Ralph and Catherine Fisher Professor at the department of Computer Science, University of Illinois at Urban-Champagne, USA. She is an expert in the area of multimedia systems and networks and focuses on quality of service management problems. Currently, she serves as the editor-in-chief of the ACM/Springer Multimedia Systems Journal.